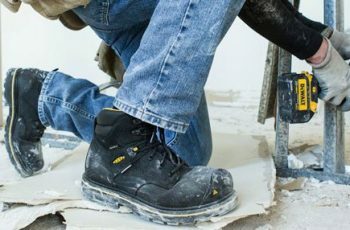 The uses of work boots span a wide variety of instances and situations. 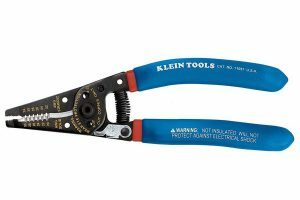 When working in the mechanical industry or with a welding tool, it is important to protect your feet with the notion of steel materials. If you find yourself working in the concrete industry, reinforced materials and a seal coated outer covering will protect your feet from the substances at-use. For each situation, there is a practical use for work boots. A second implementation these boots need to shape for the user is the notion of long-standing success. This comes in both figurative and literal speech. The figurative piece comes from the brand presented. 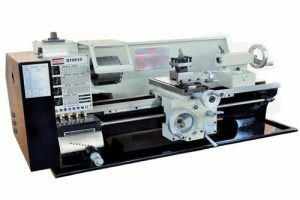 Success in this production industry will transfer into the equipment you trust surrounding your feet. Years of service and multiple product lines will also shed light on the warranted claims each boot company makes. The literal piece comes with the ability to host these boots over prolonged usages. 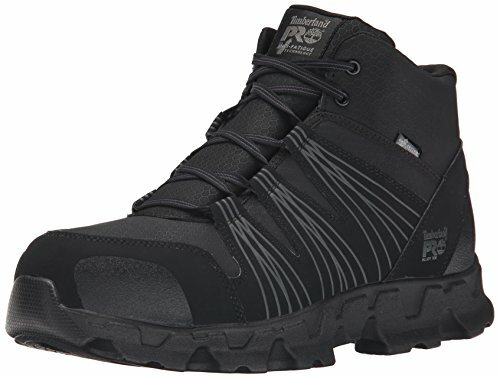 Most individuals seeking these footwear options need reliable protection against the elements and additional support for long periods of wear. 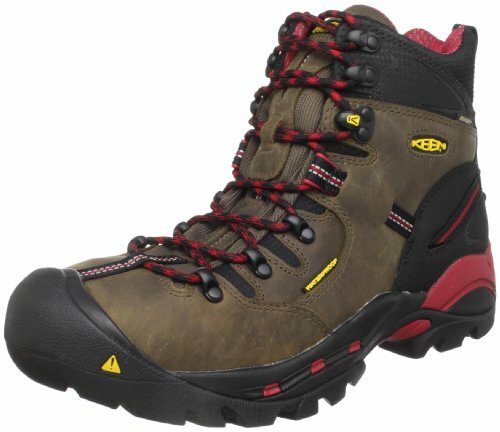 Below are allocated reviews of some of the top footwear options in the boot field. Each review details product specifics and highlights the inclusions associated with each pair. Following these reviews is an informative buyer’s guide that will present and describe certain aspects you should be targeting in the purchasing process. The Timberland PRO product line has been catering to the outdoor and indoor work space since the early 2000s. Their craftsmanship and attention to detail shines through with the 26078 models and makes the brand ideal for those looking for hard wearing construction boots. 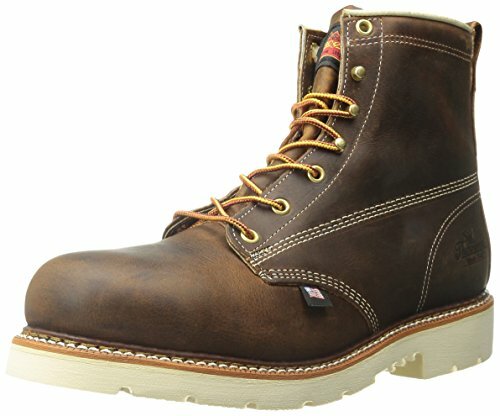 Timberland make some of the best lace up work boots in the world. Constructed purely of leather material, this coverage helps to protect against the penetration of unwanted elements and other such hazards. The toe box remains spacious and features alloy metal directly under the outer covering. This implementation helps protect your toes from facing compromising situations. Comfort is another measure that is met head-on with this Timberland model. The PowerFit comfort system was added to this model to provide all day comfort and support. This notion is supported with cushions that surround target areas such as the back of the heel or ankle and foot surroundings to keep proper footing and stability in-check. The outer sole is also constructed of a rubberized material that provides stability under any circumstance. This inclusion provides resistance to the elements, proves to be slip resistant and oil resistant, and provides ample protection against abrasions. The material construction also supports flexibility measures and reduces the time required for breaking in workboots. Simply wear and proceed to your task. There is no excessive treatment applications or other such methods to preparation before hosting usage. When searching for functionality and practicality, it is rare to find a work boot that also hosts a sleek look. 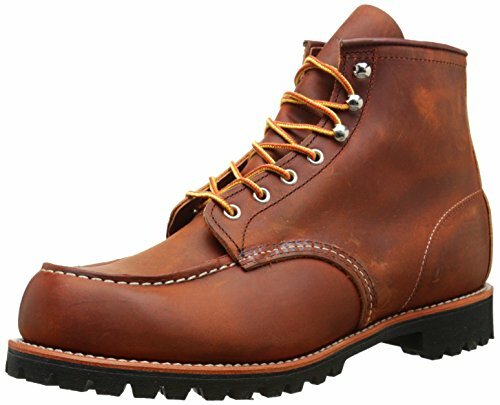 The Red Wing Heritage Roughneck Lace Ups bring all of these elements full circle with these work boots models. Fully treated with a leather outer covering, this boot severely reduces the risk of element harm and additional penetrations from unwanted materials. The white stitching makes the deep leather coloring pop, creating visual appeal with a practical use. The under carriage is comprised of Vibram materials, which is essentially a rubberized material system that helps to create traction and gripping across a multitude of surfaces. The EVA midsole creates for a soft platform for the foot. It is form fitting to the foot, adding elements of cushioning and comfort that expand across the work day. These features help to make a positive claim for this boot to withstand the pressures and demands a long work day may hold. The KEEN Utility Steel Toe work boots are designed with strength and reinforcement at the top of the checklist. Made up of both leather and fabric materials, this dual fusion helps to eliminate the penetration of unwanted elements. The back of the heel features a contoured locking device, with helps with footing concerns. It also fully surrounds the foot and rises well beyond the heel. This locking technique is matched with full coverage, keeping your feet snug and implements the use of free-flowing movements. The rubber sole features implemented traction pieces that extend from the under carriage. They help increase grip and stability across uneven or adverse surfacing. This rubberized content is also oil and slip resistant. The inner lining of the boot utilizes Dry-Lex technology. This reduces the penetration of water or soupy elements, keeping your feet dry and protected. This technology also promotes levels of increased breathability, reducing ailments found as common occurrences with other snug boot types. 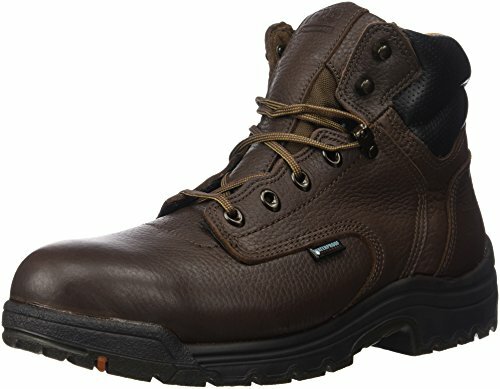 This Wolverine work boot model helps to implement many unique factors to increase protection standards and limit the amount of discomfort a user may face. The design starts with the strengthened leather covering. This treated leather provides simple protection means will hosting the ability to limit abrasions and other such unwarranted contacts. The toe box features a smaller toe capping, which severely reduces the weight of the model. This makes it a lightweight option that doesn’t compromise on spacing and comfort. The steel toe implementation covers the length of the toes, providing the ample support you need against the threat of falling objects or other such hazardous occurrences. The heel backing is reinforced and features additional elements of padding. This helps to create a solid hold on the foot and reduces the wear and tear on your ankle and foot. It also helps to keep your posture in-check and works to limit ailments faced from improper fitting settings. Thorogood stems from the footwear production company Weinbrenner. Weinbrenner’s existence can be traced back centuries, making it one of the most long-standing production companies in this industry. This dedication and time commitment can be visualized with the production of the Thorogood American Heritage Safety work boots. These boots combine excellent craftsmanship with a leather build. Practicality meets visual appeal with bold stitching and a dark, treated leather covering. The toe box is very forgiving, allowing users for ample space for comfort concerns. This space consideration also offers means of protection and usage for users who struggle with adverse foot and toe conditions. The toe box is also sealed by a metal alloy covering the resides directly under the leather. The rubber sole offers support across multiple surfaces. It also brings elements of resistant materials that assist with slippery surfaces and oil covered walking paths. Additional extensions help create for a solid grip across any path, making them a great companion for a multitude of work places. Scaling back the color scheme for a more fashionable fit is the Timberland Pro 33031 Steel work boots. These boots introduce a Wheat color scheme, making them an ample fit with any outfit. While this model does host a more visually appealing aspect, this detail is not compromised with reductions in durability, comfort, and support. It is leather treated, which helps reduce against abrasions and unwanted contacts. 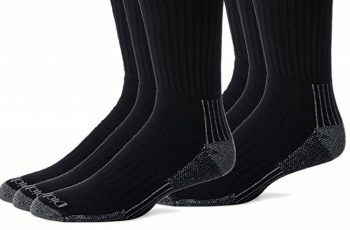 Ankle support is created through the addition of an extended padded collar. This collar features almost an inch of thickness, which helps to keep your footing when traveling across rough terrains. The ankle and heel area, a Comfort Suppression insert is added. It helps with arch support, ankle stability means, and reduces the discomforts that would be applied after extended usage terms. Finally, this boot works to implement impact reduction measures. A small plate is inserted in the outsole, which helps to break up and diffuse pressures placed on your foot. 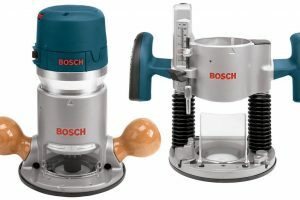 It absorbs the contact, limiting the pressures placed and increasing the period of usage frame tenfold. Caterpillar is known from their high-quality designs in the industrial space. 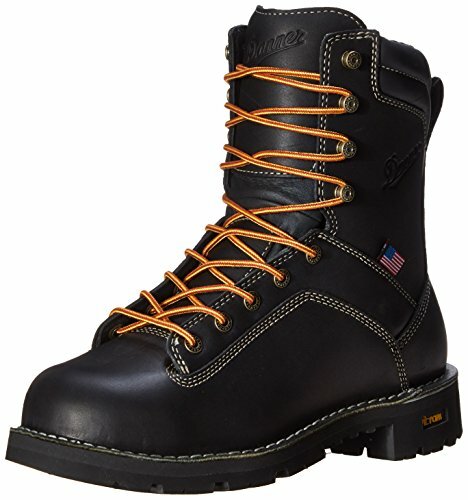 This focus is turned into productive means with the development of their HI Cut Cap Soft Waterproof boot model. Constructed of a leather covering, this boot helps build up the materials and reinforces them with timely stitching options. The leather meets up with the steel toe box, which changes the pattern to meet the functionality standards of a work boot. The under carriage is comprised of rubberized treads. These treads are grooved and extend to grip the surface. This helps with stability. Not only does this element provide support measures, but this area is treated to resist against oil and slippery surfacing. Gel implementations are met with EVA technology on the insole and outsole areas. The insole is lined with EVA protection, which is a lightweight comfort option that helps form fit to the foot. This reduces discomforts and helps support long periods of usage. The outsole utilizes the gel-like materials. It is infused into the back of the heel area. This helps with shock absorption and truly limits the wear and tear on your feet. It helps make your steps feel like gliding and can support long-term usage. 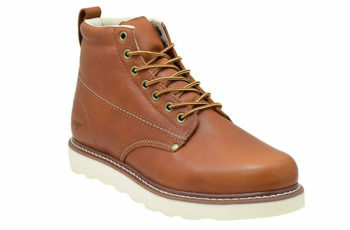 Danner adds to the quality discussion with their Quarry Alloy Toe work boots. These boots feature an 8-nch rise, which fully houses the foot and rises halfway up the knee to produce excellent stability means. This fully encompassing boot helps to keep your foot in the proper setting, reducing twists and unwanted motions. Made from treated leather materials, the constructions bode well for those facing abrasions and other such contacts. This covering proves to be impenetrable and helps reduce the amount of discomfort discovered in the workplace. The alloy toe box is both spacious and fully encompassing, covering the entire front of the foot. This added coverage stream provides additional protection against the unnecessary contact. This boot also holds the title of waterproof. Water resistant materials will reduce the risk of water damage, but waterproof options can be fully submerged without facing any seepage. This makes this model a great fit for those battling the constraints and tide changes the great outdoors presents. The Pit Boos model offered by Timberland is the all-purpose boot type. It helps reduce pressures and includes different elements from protection against many different forces. The leather treatment helps to fight against abrasions and other such penetrations. This material is reinforced, creating a strong shield against the previously mentioned threats. It also provides the user with a spacious toe box that is covered with alloy material. This helps fight against drops and spills. 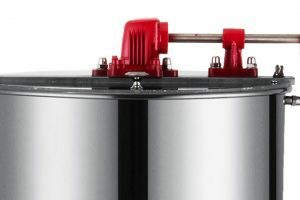 Electrical support is also included within this boot. Shockproof materials are added to reduce against discomforts and potential threats often faced in the electrical industry. Comfort concerns are also addressed through the inclusion of a polyurethane foot bed. This insert helps keep the foot stable and reduces the need to pay attention to footing. It is open-celled, meaning it helps address breathability concerns. Sometimes the change of the seasons can provide additional areas of concern or call for additional support measures. 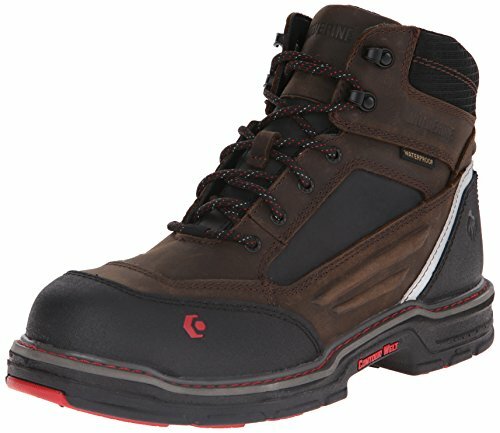 The largest area of concern is with breathability and the functionality of the construction boot. You are going to want to start with lightweight options that address and assess the potential work conditions. Below are a few options that suit this season well. It is no secret that with warm weather comes the rainy season. 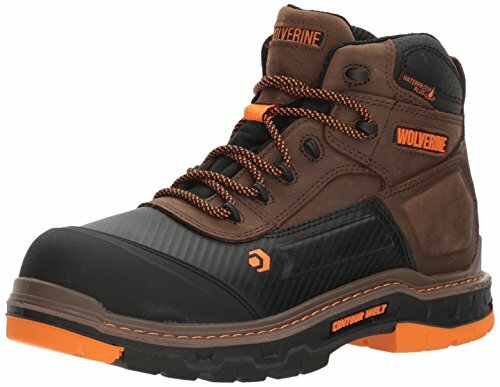 Wolverine has that element covered with the implementation of their Overpass Waterproof work boots. This waterproof model implores the notion that the boot could be fully submerged without facing water seepage in the sides. This notion helps work to the benefit of those working with sloshy environments or places that are at-risk for rainy spells. The toe box is made from carbon materials, severely reducing the total weight of the boot. This lightweight notion is the perfect fit for those working with warmer conditions. It helps to reduce the pressures and increase breathability measures with its unique construction styles. The footbed features the use of Ortholite technology which is important in providing comfort measures throughout the demands of a long work day. These orthotics help to form fit the foot in a memory foam type fashion, which helps tailor to your daily course of action. 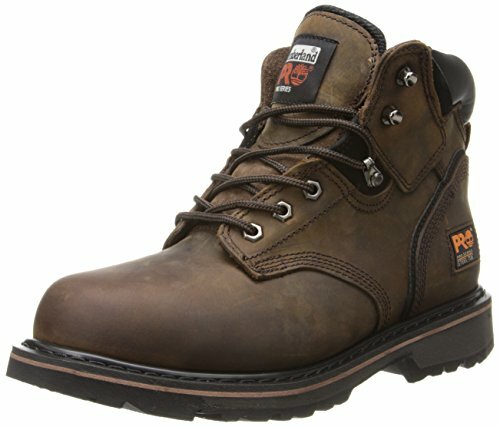 The KEEN Utility Braddock Steel Toe work boot is comprised of both leather and fabric materials. The leather provides the strength considerations you need, while the fabricated materials are used to pin holes and breathing areas for the foot. The duality of these forces works to address both protection and breathability concerns. The materials comprising the other portions of the boot are constructed with a waterproof notion. This makes it a good fit for the hotter climates. The undercarriage is designed with a grooved texture and surfacing. This helps you to gain traction across the different paths you will travel. It is also oil and slip resistant, leaving any landscape open to your path of travel. How about a more practical piece for the on-the-go user? 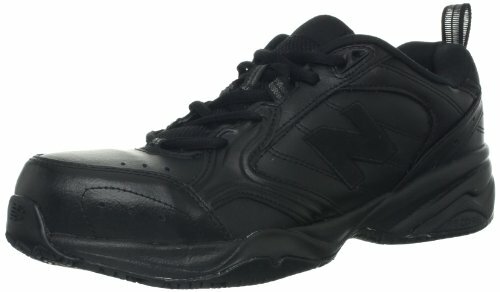 New Balance has added their name to the work boot space with the creation of the MID627 Steel-Toe models. 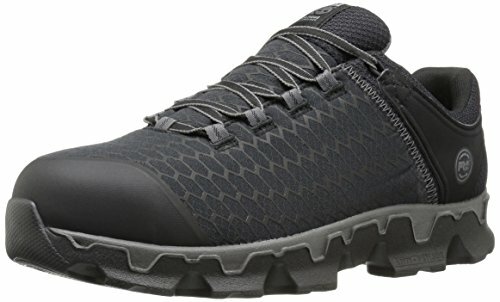 This model looks, feels, and fits like a running shoe. This factor alone helps reduce the amount of weight it possesses. The lightweight notion isn’t the only selling point for this model. The undercarriage hosts a similar structure to their many lines of athletic footwear. This helps to implement the proper mid-rise near the arches and adds padding to the front toe box and rear heel. It is made up of synthetic materials which caters directly to the summer market types. This reduces the amount of weight the total package possesses. While the material is less resistant, it is reinforced to provide strengthened protection. This material also hosts a water-resistant notion. Timberland also finds success in the work shoe space, developing their Powertrain Sport Alloy Construction shoes. This model, from the outer surface, looks like a shoe. Its functions and features tailor to the working individual, holding operational capabilities that mimic that of a boot. It is comprised of synthetic materials, which helps to host the lightweight title. The outer covering also features a nylon covering. This nylon implementation does not rip or tear, making it a great measure for those working around potential abrasions. The inner portion of the shoe is lined with mesh materials. This mesh is treated with odor control technology. This helps to reduce the amount of perspiration your feet are giving off, keeping little pressure on important areas of contact or push-off when in step. The synthetic nature greets the surroundings of this lightweight Timberland model. This feature makes the product a great fit for the summer workspace, severely limiting the amount of weight given off from the materials and adding increasing notions of air holes for foot breathability. Timberland also introduces a unique implementation in the outsole and undercarriage of the shoe. This area is made up of completely synthetic materials. This inclusion keeps you light on your feet and will host the feel that mimics that of a memory foam bottom. The synthetic bottom also supports the elements of travel. The user can scale adverse plains with ease since this material helps absorb contact shocks and other such pressurizations. The synthetic nature also makes an appearance in the flex of the shoe. The front toe box remains flexible while the back heel remains steady. This is an important flex structure for those who are scaling a multitude of surfaces on a daily basis. It helps keeps your footing consistent and reduces push and pull on the foot and ankle areas. After a briefing that shows you some of the most popular brands and boot types, it is important to dissect the features that give these products a claim to fame. Some aspects are more important than others and creating these distinctions can give you a buying advantage when going through the purchasing process. The materials that makeup the boot is very important to the productivity of each model. More times than not, these items will be discussed and laid out for the consumer. Leather is one of the most popular materials used to host a strong makeup. One doesn’t need leather makeup if they are searching for protection against certain elements. For example, if you desire a waterproof model, this notion can be met through the use of synthetic, fabricated, or textile means. Knowing this can directly attribute to total wright considerations, which is a very important factor when considering all-day usage. It is best to lay out your certain prescriptions before starting your search. Narrowing down the options can help with starting the process to finding the correct fit. One of the easiest features to spot and host is a large toe box. This is important across all fields of work for a few different reasons. One of the main reasons is the health of your foot. A large toe box gives your toes room to move freely. If you have a small toe box, you run the risk of developing foot related issues such as plantar fasciitis. This can be directly avoided through finding a open that houses an open toe box. The second comes from the work place. If your toe box doesn’t feature any height, it directly takes away from the success and the function of the steel toe inclusions. When this plate is located directly above the foot with little wiggle room, you’ll be at the mercy of the abrasions or dropping the material on your foot. The vibrations and pain become more vivid when there is little spacing between the steel toe element and your foot. Give yourself this extra space to host benefit under both of these mentioned circumstances. The undercarriage represents a major target area for consumers. It helps to keep you stable on the surfaces you travel and provides traction where it may be required. If you are traveling across diverse surfaces on a daily basis, look for the bottom of the shoe to implement some traction means. These will come in the form of rubber spikes, grooved patterns, and other such inventions. They will often extend from the outsole and will become the main form of contact with the ground. Knowing this, it is important to see that the makeup of these materials is both strong and reinforced in some nature. Plastic means will break off easily and become less effective for the user. A strategic pattern that features in-depth structures on the bottom of the shoe are your main form of helpers. The maker of the boots is an important factor of consideration. Lesser known brands will attempt to mimic the functionality of these popular models, which severely puts a damper on the production you gain out of the boots. When it comes to something you are wearing day in and day out, it is important to host the correct brands. One of the largest brands in this space is Timberland. They developed their PRO line to directly cater to the working individual. 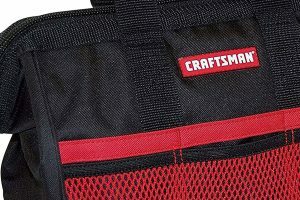 This product line expands from horizons that meet the needs of anyone from linesman to construction workers. Their top materials include leather that is treated to perform a certain element of protection for a prescribed space. Timberland does not compromise on quality and construction means, leaving you will a name to trust in the industry. Thorogood-American-Heritage brand is a second long-standing company. Their roots trace back to the late 1800s, leaving them as one of the first pioneers in this space. This time spent on development and continued production has allowed the company to perfect their craft. You know you are obtaining a product that has spent countless months in the development phase, ensuring the final product would meet the prescribed needs of the users. Caterpillar is yet another brand that carries many years of success. 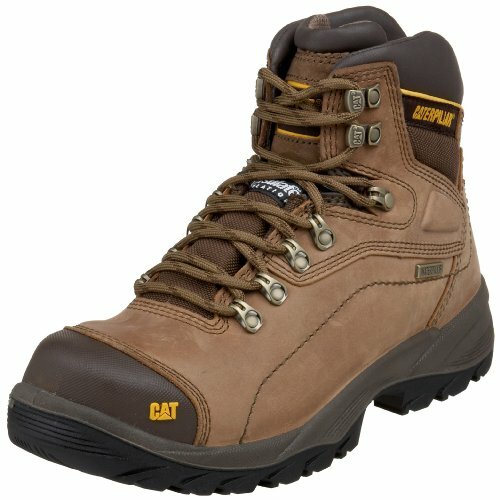 Known primarily for their industrial strength farm equipment and outdoor vehicle production, Caterpillar brings this same stance to the development of their work footwear lines. This sense of carryover helps them to implement the same standards that have brought them success in past endeavors. This helps create for another sound and solid brand you can trust in this space. 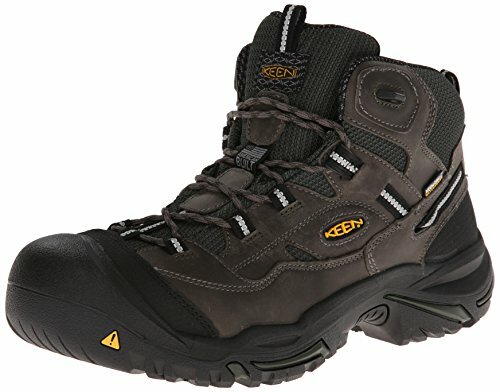 Other popular brands include Red Wing, Wolverine, Keen, and others mentioned throughout the reviews. Each of these brands provides a working platform for your industry. These platforms are continuously changed and built upon to continue to provide support for all walks of life and work positions. If you take anything away from the discussion today, remember to start by assessing your needs. Understanding the space that you work in and the demands that you are to meet are the most important areas of consideration. This will provide to be a directional piece that draws you to a certain brand or boot style. Brand recognition is important in this space and it is also important to compare and contrast your options before purchase.